Last week reader Sally B. sent me a great little bag of vintage keys, (WOOT!) 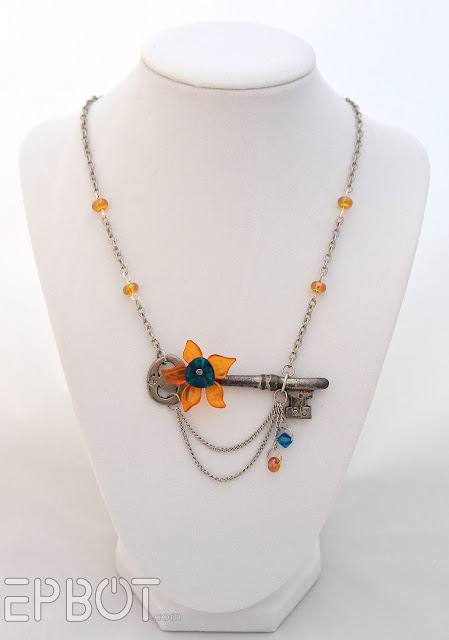 which inspired me to start playing with some key jewelry designs. I think it will be be pretty self-explanatory how I did everything, so let's get right to the photos! 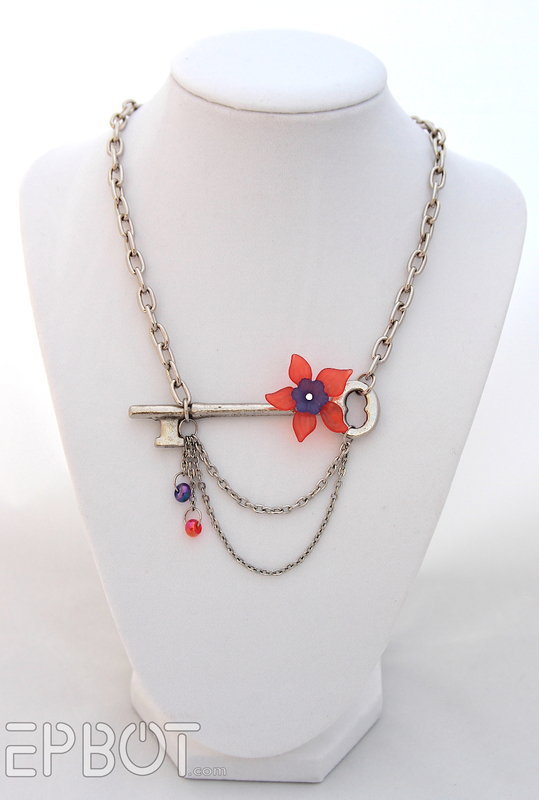 This key was still a nice shiny silver, so I used matching chains and a cheerful pinkish-red and purple for a bright, modern look. Most of what I used came from my jewelry stash, which is a mix of old jewelry I've taken apart plus bits and pieces that you guys have sent me over the years. The only parts I purchased are the tiny accent beads and crystals on my next two designs. This is one of my favorite keys, and I've been saving it for ages now; I love the numbers stamped into the handle and on the end. I think it has just the right amount of grunge to give it a sense of age, too. It's really hard to choose, but I think this one is my favorite. The colors are just a bit more "me." Oh, and if you're concerned about rust getting on your clothes, just spray your keys with a coat of flat clear spray lacquer. (Be sure to wash them first, to get the loose bits of rust off.) Make sure it's a flat clear coat, though; you don't want your rusty keys looking shiny! So which one's your favorite, guys? Tell me in the comments, so I know which ones to make more of! Otherwise they are lovely. Well done and I'm feeling inspired. Hmmm...anyone know where I can get twee li'l tentacled babies? There are some cool copper gears on etsy. I would totally go for one with gears on it, but otherwise I think the copper one is really cool. My favorite is the copper one, but they're all fantastic. The old mysterious-looking keys combined with flowers immediately brings to mind "The Secret Garden" by Frances Hodgson Burnett, one of my favorite books. Well, I say one, I have probably at least 2 dozen "favorite books" if not more. I think a small skull hanging off the skeleton key would be cute. Almost as cute as the flowered ones you show us. I love the orange one with the red center! I like how the flower is slightly uneven and the leaf is cool. I like the orange-red/purple one too. The last key was definitely my favorite! I just adore that little leaf! I think your favorite is definitely my favorite too. Sadly, I'm not a flower sorta gal. All three are so beautiful! I can't really choose, but I think I am leaning toward the first one. So pretty! They all look really nice. I think I prefer the more delicate chains with the bead accents. I may have to try something like this though. I got the cutest earrings and bracelet from my husband for Christmas, and I want to make a necklace with matching beads. 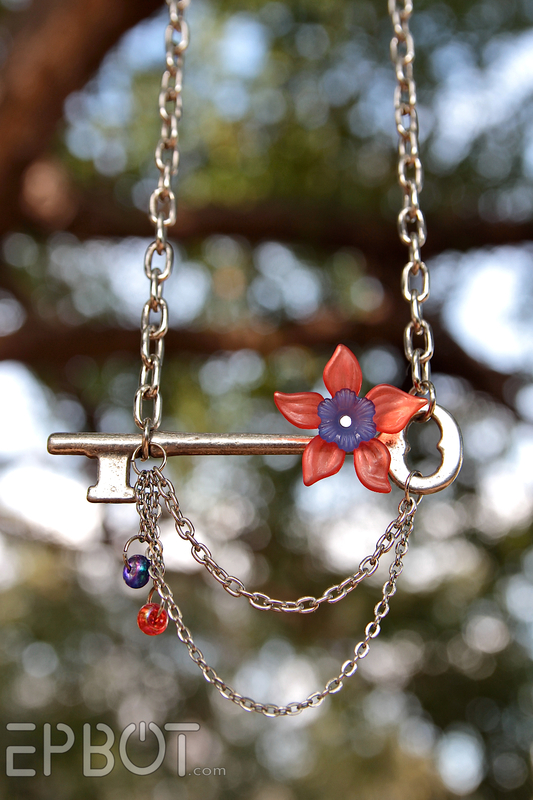 The key and flower together are just too cute. I love the copper one! I think that I like purple color the most though. I wonder how they would look together? This will be my next project when my sister and I get together. Oh, what a fabulous idea! I picked up some of those keys at a flea market a few years back, and haven't yet done anything with them yet... might have to now! I even have copper jump rings somewhere! As far as my favorite... so I'm apparently one of the few people on the planet who really doesn't care for orange, and purple is by far my favorite color. However, of these, I like the copper one best. I think it looks most cohesive, somehow... the pieces seem to belong together most. Great job on them all, though! Although red is my favorite color I think my favorites tie between the other two. 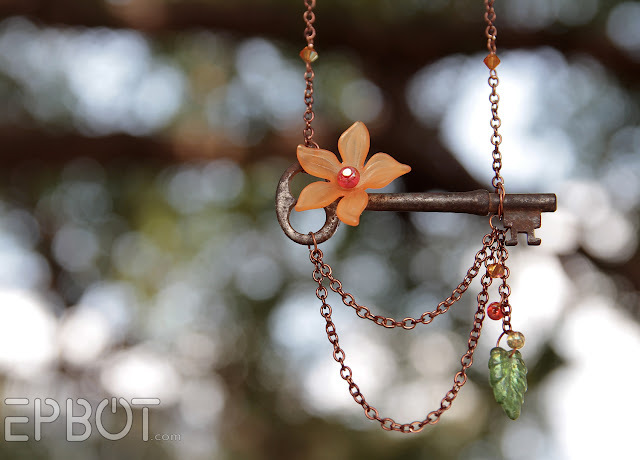 I adore the copper one, and the leaf is a nice touch with the flower but the orange beads on the copper chain sort of blend in. I love how the tangerine/yellowish beads pop against the silver chain. Maybe purple or green beads against copper next time? Anyhoo, those are minor details because you asked. All are lovely and more than I could make, so keep up the great work!! I love these! My favorites are the teal/orange and the third peachy one. Very crafty! The orange/purple is my favorite, I tend to favor silver metals so I love that combination. But I also really like the copper one with the leaf! I love the rusty one! It looks so cool. I have a bunch of keys they need to made into something. I'll have to figure out a way to make one a necklace that doesn't involve metal touching my skin. I really love these! 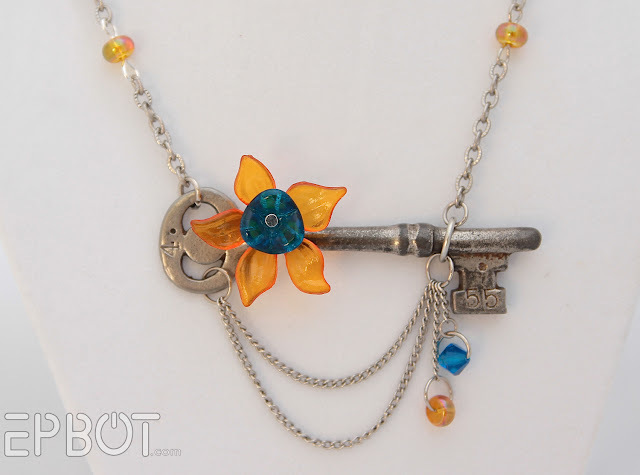 I posted two photos (the orange and teal necklace) with a link back to you on truebluemeandyou. I mentioned on my blog how I have a bag full of really old skeleton keys that I haven't known what to do with (do NOT want to paint them!) but I never thought of hanging them horizontally. This is giving me so many ideas! Love the one with the leaf, but so long as the key has the number stamped on it and some nice patina, I'm happy with all the designs! :) Beautiful pieces. I love the orange and purple one! Such a cool idea. Purple is my favorite color, so I love the purple/red one. But I think my favorite is the teal/orange. Teal and orange is my favorite, though I do like the leaf hanging down on the third one. These are beautiful, Jen! Of the three, I actually like the pink flower best. 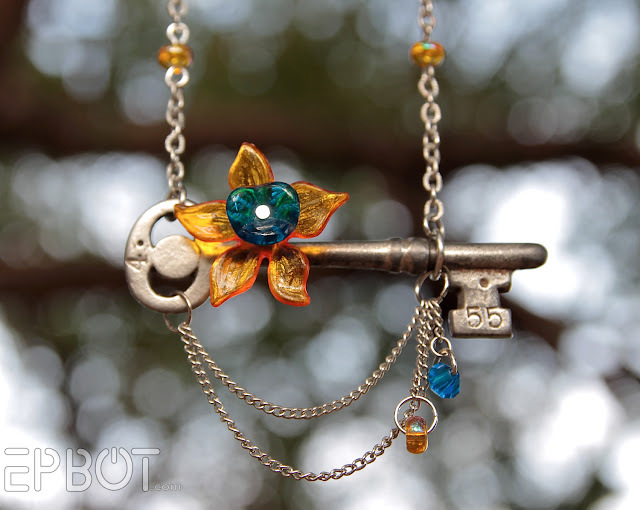 BUT, what about a copper key/chain with blue beads and a seahorse charm dangling?? :) Or some epoxy candy with a shiny key, a la Willy Wonka? If you ever get tired of blogging (don't get tired of blogging! ), you can start a crafting career on Etsy. I love the purple and coral. And my next question is when does your etsy shop open? It's really hard to choose a favorite, but I think I like the pink and purple one best. The colors and shiny silver speak to me. Were I to choose a color combo, I would go for a blue and purple or blue and green look. The purple is my fave, but they are all beautiful. Thanks as always Jen for sharing your work and inspiring others! I was just at JoAnn's yesterday, ha! Looks like I'm going again, blessed are the 50% off one item coupons they send me :-) and thanks to you, I use them frequently. The copper is hands down my favorite. I love the orange and green together and copper is so much nicer to look at than gold or even silver. Ooh, rose gold, though, might be excellent with the right key! I love what you've done with these keys, Jen! You are so creative! When I received the box of keys, I knew immediately that you should have some of them! If you need more, please let me know! They are all mind-blowingly beautiful but I'm drawn to the colors in the copper one the most. The key is now wrapped in wire and beads but I've never rigged it up to wear it. I love the horizontal idea, although I can't wear metal so chains aren't possible. I somehow missed this post yesterday, and went to True Blue Me and You this morning, saw her re-post and the picture and thought "Omigod, Jen would love that!" Then I saw the Epbot part. So yeah, I'm guessing you really would love it, seeing as how you made it . . . D'oh! I really love them all. I love the heftier chain on the red and purple one, but I love the colors of the goldish and teal one, and I love the rustiness of the 3rd key. So, after much deliberation, if you're going to make more, I think you should make them however you fancy because they're all fabulous! Love them all. You are giving me a idea for my bottoniere i have to make. Been loking for something original to do and with Charissa idea for gear, bird and octopus. I just mith have something. Thanks girls! So hard to choose a favorite! Probably the copper one, with the silver-red-blue one a close second. The rusty copper one is the best! Although, when I first read the post, I was confident the first one was going to be my favorite. I love the last one, but purple is my favorite color so I have to go with that one as my favorite. These are great! I really, really dig the purple and orange one. I think those two colors look so sharp together. Do you ever/would you ever sell the jewelry that you make? I would buy pretty much any piece you make. Seriously. The old rusty one is by far the best. These are awesome necklaces. You should totally sell them. Loved the copper necklace...it's awesome...you are awesome!!!! considering silver is my all time favorite in anything, i am surprised to be replying that i adore that copper one! seriously the copper is my favorite. want! Ooooh, the teal and orange, definitely. These are all gorgeous designs, but I love the way the transparent glassy look plays off the dinged up key, and the key detail add character too. Excellent! Now how can we get these?? I've been toying with some ideas for skeleton key jewelry. Mine are significantly more *ahem* manly, but still. 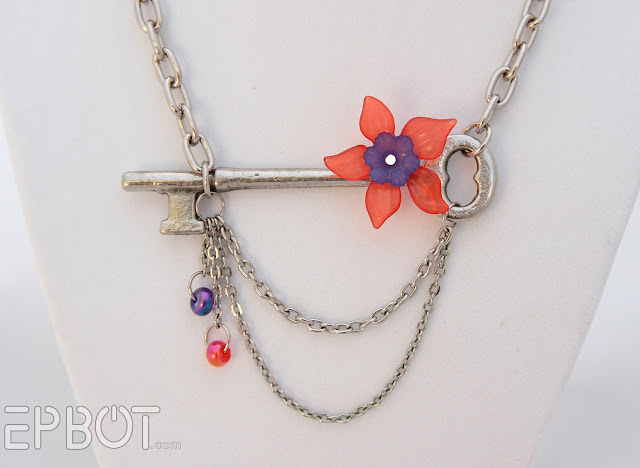 Skeleton keys are really cool and have tons of potential for all kinds of things. I normally prefer silver but I totally love the copper necklace! It all just works so well together. 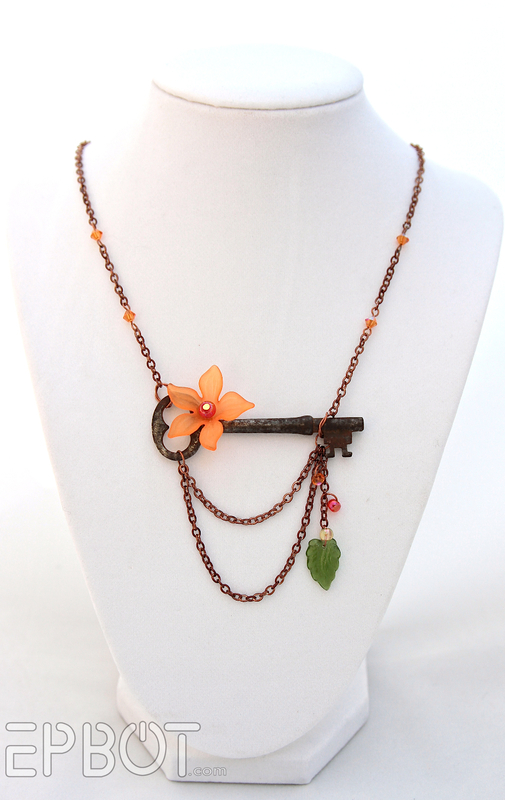 And like ScaperMama said, a copper necklace/key with blue beads and a seahorse charm sounds gorgeous and would be right up your alley! 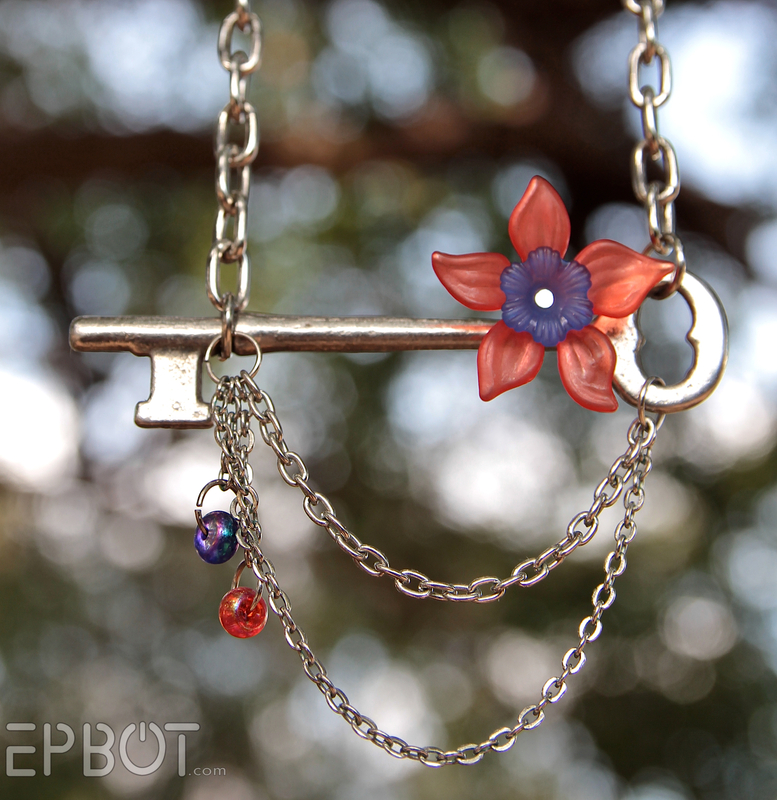 I love the little leaf charm on the last key! I was on another site and saw a pic of the orange and blue one and my first thought was "Jen would LOVE these". Your style is easily identified. What a gorgeous project! I particularly like the orange one with the leaf. Perhaps I'll do something like this with my old keys. :) Thanks for sharing, Jen! Are you a Gator? :) My favorite is the orange and blue one. I really like the third one with the leaf. I do wonder, though, does the rust rub off on your blouse or skin? I think a copper key would be neat. Now you'll have me hunting skeleton keys to try my hand at this. I really like the orange one with the leaf hanging off of it. It's lovely. They're all beautiful, but my favorites are the first and last ones. 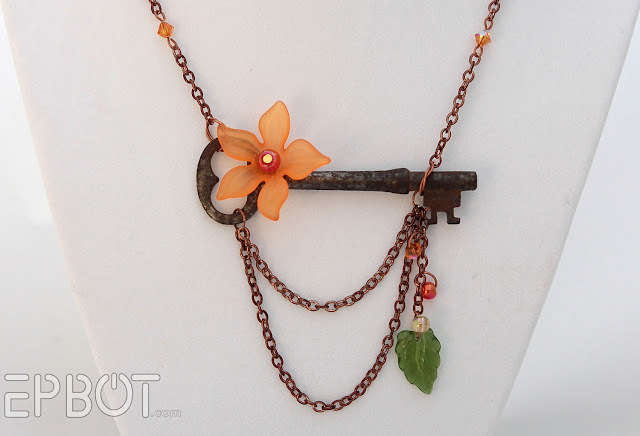 I love the texture contrast of the flowers and old keys. And I love flowers! Please consider selling them - I'll buy one at any price!!! (well, as long as its under $50 cause that's all I can afford). If you put them on Ebay or Etsy, I know they will be snapped up in minutes and you'll get a great price. Maybe a new side business for you? All your jewelry is beautiful and so cool. The orange and teal! I am so not a jewelry girl and not girly at all but there's something about these necklaces that make me want to wear them all day. They are the perfect piece for someone as style challenged as me. I like your favorite, too. I'm not usually an "oooh, shiny" kind of person, and I've been more into browns and rust tones lately. The green accent is perfect. Oh! Still drooling over the copper one!! must recreate! I like the first and last because they feel softer to me. Like them all but a toss up between the copper one and the one with teal on it. Totally going to steal this idea. I have to agree with you that the last one is my favorite. It seems earthier than the other two. But I'm oddly drawn to the color combo of the first necklace. This is giving me some great inspiration, though. 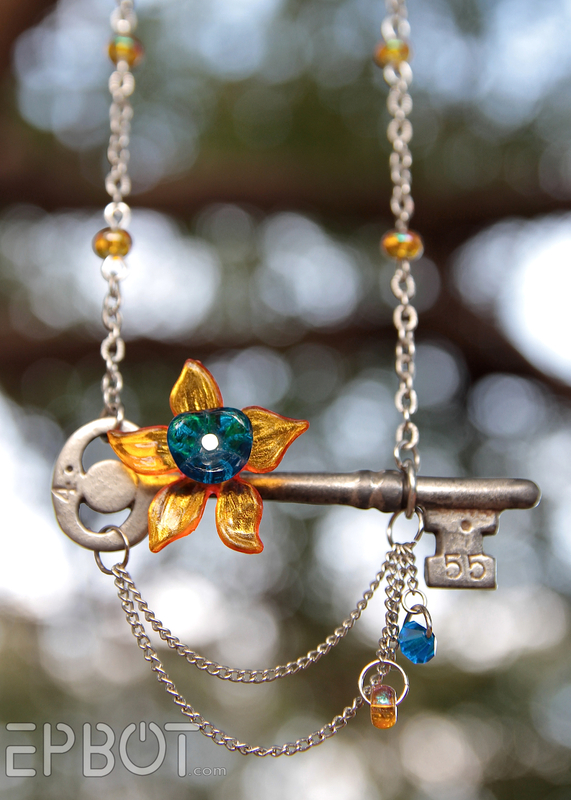 I've been working on a "Secret Garden" inspired necklace since as a little girl it was one of my favorite books. Is there a link where we can see all of your DIY/instructions? @ Becky - right now the only way to see all my tutorials in one place is to click on the post tags DIY or Tutorial below the post - but you've inspired me to get them all together on one page for easier browsing. That's going on the to-do list, so thanks! Love your blogs, and you should really put some of your creations on Etsy, I'd buy them in a heartbeat! Love these so much! I really like the color combination on the second one! I've developed quite the love for skeleton keys so I just might have to try this out! These are great! Especialy love the teal and orange one. Also, this reminded me that I had some old keys lying around, so I'll be making some too. Thanks for the inspiration! Love them. My weekend job is at the Magickal Muse at Renningers. I don't know if you're aware but the market puts on a Steampunk show, the next one is in September. They all look really great, i better not show them to the wife !